Whole dark fruits with all their precious, natural ingredients give this delicious organic multi-fruit juice its strong colour and high vitamin C* content: As little as one glass (0.2L) meets an adult’s daily vitamin C requirement. It strengthens and can assist in coping with oxidative stress, especially during hectic times. This bioC Antioxidantien juice accompanies you through your everyday life and can be an ideal component in the important context of a varied, balanced diet and healthy lifestyle. Every bottle of Voelkel’s bioC Antioxidantien juice contains the best for you and your family – inspired by nature’s wealth without any synthetic additives. * Vitamin C helps to protect cells from oxidative stress. Where can I get Voelkel’s bioC juices ? 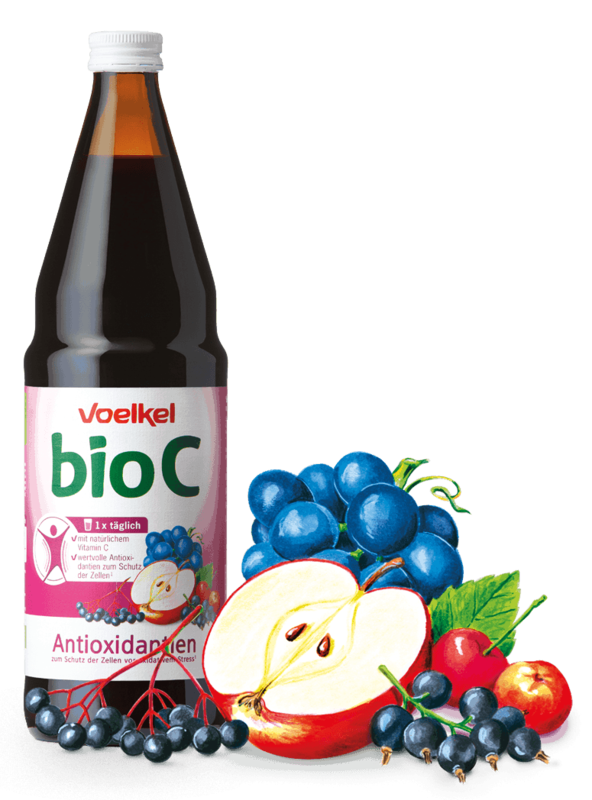 Voelkel’s bioC Antioxidantien juice is available in health food shops, organic grocery stores and from specialist dealers. You can also order our juices from our online Voelkel-Shop.